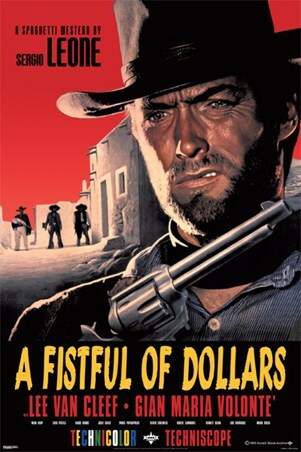 Film Maxi Poster: If you are a fan of classic spaghetti western films then you will love this brilliant poster for the 1964 release 'A Fistful of Dollars' which was directed by Sergio Leone. The iconic Hollywood actor Clint Eastwood is pictured in character as Joe aka "The man with no name" as he holds his single action army 5 1/2" artillery gun close to his chest. The background is crawling with members of the Rojo family and John Baxter the town sheriff.